The classic neighborhood bar is something of an American institution, and Michigan won't be slack in regard to its own offerings on this front. Often simple, always comfortable, and often a lot of fun and full of regulars, the neighborhood bar has a charm all its own. 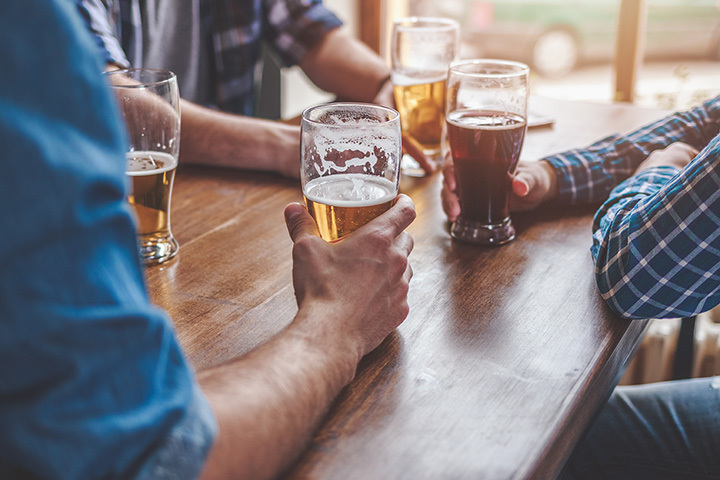 Check out these 10 great bars to possibly find your next local watering hole! Described as the most politically active bar in Hamtramck—and by extension Detroit—Whiskey in the Jar is particularly welcoming to newcomers. Those who have never actually been here before will be treated to a free shot of Jezynowka, which at last report is a blackberry brandy. From there, enjoy a slate of themed parties, a regular conversation about politics, and the constant presence of what may be the bar's mascot: the rattalope. The Salty Dog in Madison Heights wins a special note here for two reasons. One, the bar is located entirely in a building that looks at least somewhat like the forward half of a ship that has beached itself, mysteriously, on concrete in Madison Heights. With beer specials when the Tigers play, and burgers on hand, it's every inch the consummate neighborhood bar. Traverse City does its neighborhood bars a little differently, and Brady's Bar is a perfect example. Clean and with a good range of drinks, staffer Wendy Blodgett described the bar as “a bunch of moms with a huge kitchen, a huge living room and a liquor license.” Decorated with a hunting theme, and offering several breeds of beer special, it may not be the biggest, but it's one of the best. The best dive bar in Grand Rapids, as far as Revue Magazine's “Best of West” 2016 edition is concerned, is found in Mulligan's Pub. Featuring “stiff drinks for dirt cheap,” Mulligan's offers an extensive range of drink specials. It's also, at last report, the seventh-largest source of Pabst Blue Ribbon sales in the United States. Kalamazoo's Green Top Tavern, owned by an older married couple, is a classic spot. Offering great drinks and hearty sandwiches, this spot is everything you look for in your local neighborhood bar. Expect a relaxing and welcoming environment at Green Top. With locations in East Lansing, West Lansing, Grand Rapids and even Toledo, Ohio, the Tin Can Bar might be the first example yet of a chain neighborhood bar. Focusing on canned beer—as the name implies—the Tin Can Bar takes this particular ball and runs with it, past the goal line and out of the stadium. With over 80 different canned beers on hand—and around half of these being from craft breweries—it's a safe bet you'll find what you'll want here. Throw in some more exotic fare, like a Michigan-signature Faygo Bomb made with Faygo pop, along with snacks like wings and nachos and you'll be well taken care of here. Check out the Torch Bar & Grill in Flint for a slice of neighborhood bar so special it's won national awards. It's one of the leading sellers of Guinness in a 22-county radius of Michigan, according to Fabiano Brothers distribution figures, and it's been home to its signature burger, the Torch Burger, for the last 50 years. Throw in a slate of special events and it's the kind of place that will have visitors coming back regularly. The “Five Star Dive Bar,” or so it calls itself, Holland's Itty Bitty Bar is not a place that takes itself too seriously. Given that the bar's website features amazing artwork that involves Big Bird having drinks with Wonder Woman, that much is clear. It also claims to be the winner of the “Art Vandelay Award” for four years running, which appears to be less an actual award and more a Seinfeld reference. With daily specials and some truly noteworthy food, this is your absolutely quintessential neighborhood bar. The good part about Redford's Fireside Inn Dive Bar is that there's absolutely no doubt that it is, in fact, a dive bar. It says so right in the name. There's more to it than just the name, though, as it will bring in not only a slate of drink specials, but also pool tables on hand to let you make a complete evening of the place. There are even food choices on hand, and reports suggest the Philly steak and cheese is seriously impressive. This one is incredibly special. Hulbert Happy Hour offers something unique: Deer watching. Yes, this great local watering hole with good drinks and hearty food provides the opportunity to watch deer right from your table. Throw in live music and a string of special events, and Hulbert Happy Hour is a unique and fun option for going out.